If Angelo Gaja is the ”king of the Italian wine world” then the shining jewel in his crown is most certainly the “Gaja Barbaresco”. Great-grandson of Giovanni Gaja, founder of Gaja Winery in 1859 in the Langhe district of Italy’s Piedmont region, Angelo Gaja is credited with revolutionizing the “vinification of Nebbiolo”, that haunting, complex, highly tannic and acidic native Piemonte grape varietal used for making both Barbaresco and Barolo. To pluck Barbaresco, one of Italy’s countless varieties of vinifera, out of obscurity and mediocrity, and put it firmly on the world map of revered wines required courage and a break from tradition, and Angelo Gaja did not lack either. He began by introducing major changes in the vineyard and the cellar. In the vineyard Angelo Gaja reduced yields and even went so far as uprooting Nebbiolo vines in some areas and replacing them with French grape varietals Cabernet Sauvignon (used for making Gaja Darmagi translated as ‘what a shame’ in Piemontese), Chardonnay and Sauvignon Blanc. Nothing less than sacrilege which often brought him at loggerheads with his father. He also decided to completely stop buying grapes from outside growers and make only estate wines. In the cellar he introduced temperature controlled vinification in stainless steel tanks, malolactic fermentation, shorter maceration, ageing in new French oak barriques and finishing in big Slavonian botti, techniques alien to tradition-bound Langhe, all of which led to the production of a more gentle, elegant and approachable wine, giving a new international perspective to Gaja wines. Building on a series of vineyard purchases in excellent locations by his father Giovanni, Angelo created the famed single vineyard Barbaresco mono crus, Sorì San Lorenzo (1967), Sorì Tildìn (1970) and Costa Russi (1978) in additional to one regular bottling. Talking about Nebbiolo from San Lorenzo, Robert Parker said that it was “reminiscent of what a fictional blend of Romanée-Conti and Mouton-Rothschild might taste like”. In 1996 Angelo Gaja did the unthinkable and moved his three single vineyard Barbarescos from DOCG to Langhe denomination, since he felt that the wines will benefit from the addition of upto 15% Barbera grapes in the final blend. However his children, who are now in-charge of operations at the winery, have moved the wines back to Barbaresco DOP (equal to DOCG under the new EU rules) and the wines from 2013 vintage release are once again 100% Nebbiolo. Moving outside Barbaresco, Angelo Gaja acquired land in nearby Barolo in 1988, and in the 1990’s even decided to look beyond Piedmont. He purchased vineyards in Montalcino (Pieve Santa Restituta) and Bolgheri (Ca’ Marcanda) in Tuscany. With focus on quality, Angelo introduced grand cru prices for Gaja wines, making them one of the most highly-prized and most expensive Italian wines in the world. 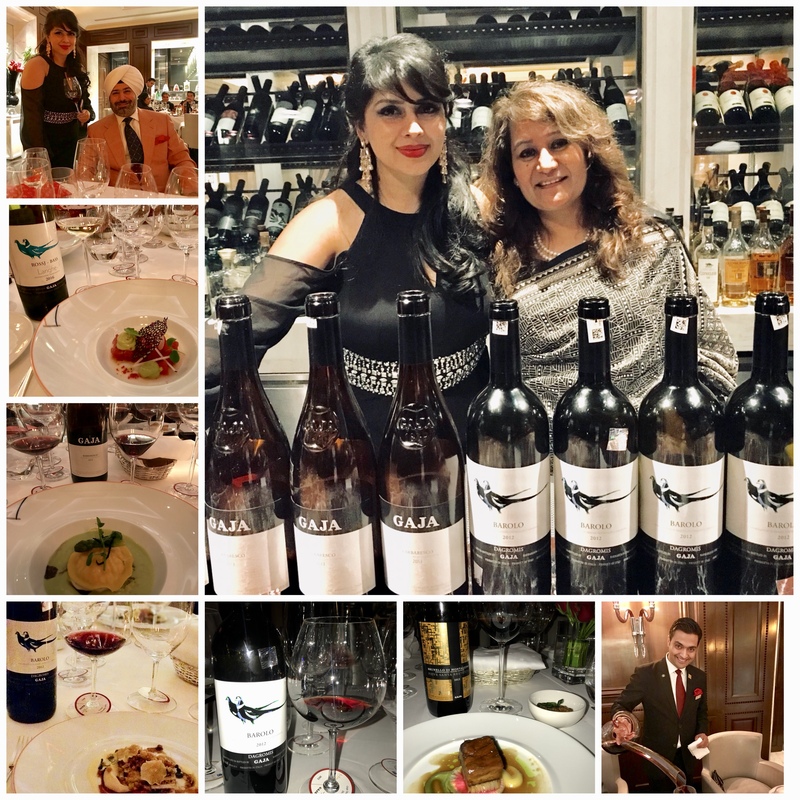 So recently when I received an invitation for a Gaja Dinner from Aman Dhall, whose company Brindco imports Gaja wines into India, and his gorgeous and most competent better half, Madhulika Bhattacharya Dhall, owner of India’s finest wine store La Cave at Select City Walk Mall, Saket, I was obviously elated. Firstly because a Gaja Dinner was being held in India after a gap of four years and secondly because these wines cost a fortune. 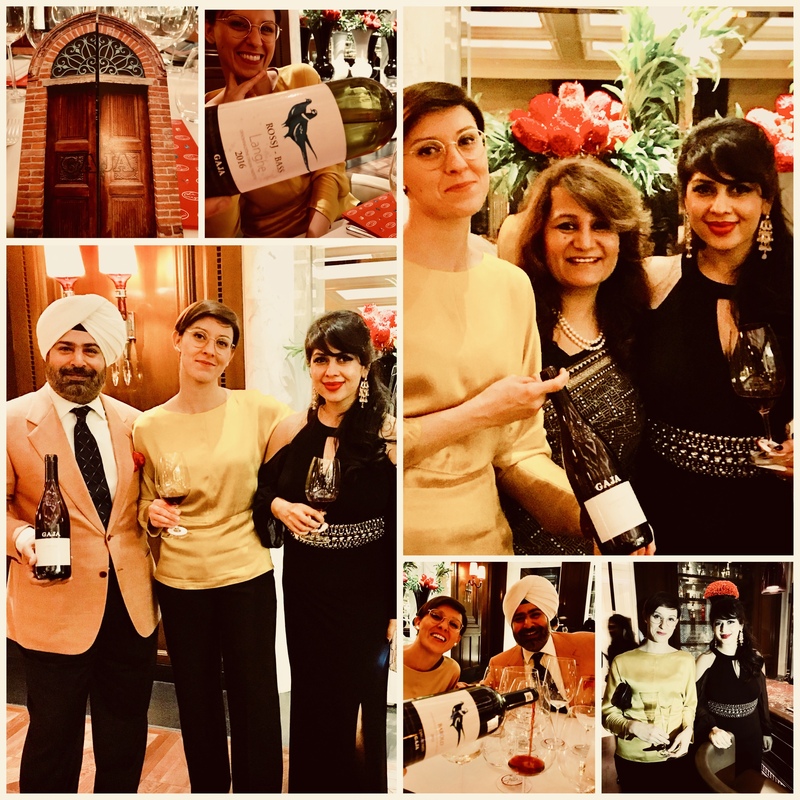 Sara Cabrele, Brand Ambassador of Gaja flew in for the occasion and spoke at length about the philosophy of Gaja and what makes their wines so special. Gaja Rossj-Bass 2016, 95% Chardonnay with just 5% Sauvignon Blanc, from grapes grown in multiple estate-owned vineyards. Rossj-Bass is named after Angelo Gaja’s youngest daughter Rossana. An easy drinking wine with a gorgeous nose and versatile palate.The top end Chardonnay from the Gaja portfolio Gaia & Rey (which was not served at the dinner) is named after Angelo Gaja’s oldest daughter Gaia Gaja and his grandmother Clotilde Rey. Gaja Dagromis Barolo 2012, 100% Nebbiolo, named after the Gromis family from whom the Gaja family acquired vineyards in La Morra commune of Barolo in 1995. A very approachable wine with tamed tannins that did not take too long to open, unlike most Barolos, and is good to drink now. 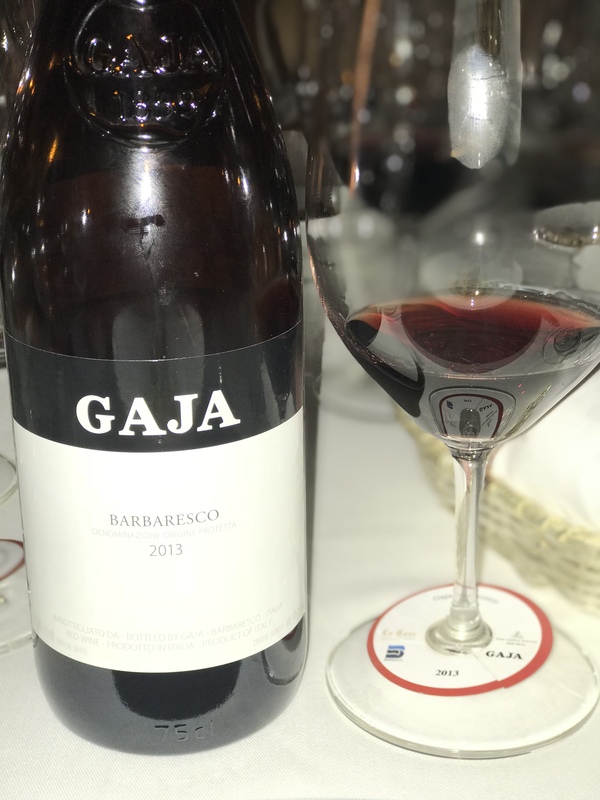 Gaja Barbaresco 2013, the estate’s flagship wine since 1859, 100% Nebbiolo sourced from 14 different Barbaresco vineyards, a compelling wine with fleshy and seamless structure, superb balance, magnificent tension and a complex finish. What I loved about this particular wine was that even though it was young, the stamp of greatness was clearly evident. It was not just speaking but singing and nothing is more wonderful than to hear a wine sing. Gaja Pieve Santa Restituta Brunello Di Montalcino 2012, 100% Sangiovese, a quintessential Brunello with great ageing potential. Missing from the dinner was my favorite Gaja Promis, a gorgeous Super Tuscan (blend of Merlot, Syrah & Sangiovese ) from Ca’Marcanda This along with the other Gaja wines served at the dinner are all available at Madame La Cave’s store, La Cave Fine Wines & Spirits. Gaja Dinner by Brindco & La Cave at Le Cirque, Leela Palace. With Aman Dhall & Madame La Cave Madhulika Bhattacharya. Meanwhile Gaja is planning to expand to the most exciting wine region in Italy, Sicily’s Mount Etna, where in a joint venture with local producer, Alberto Graci, they have purchased vineyards planted with Etna’s indigenous grapes Carricante and Nerello Mascalese. 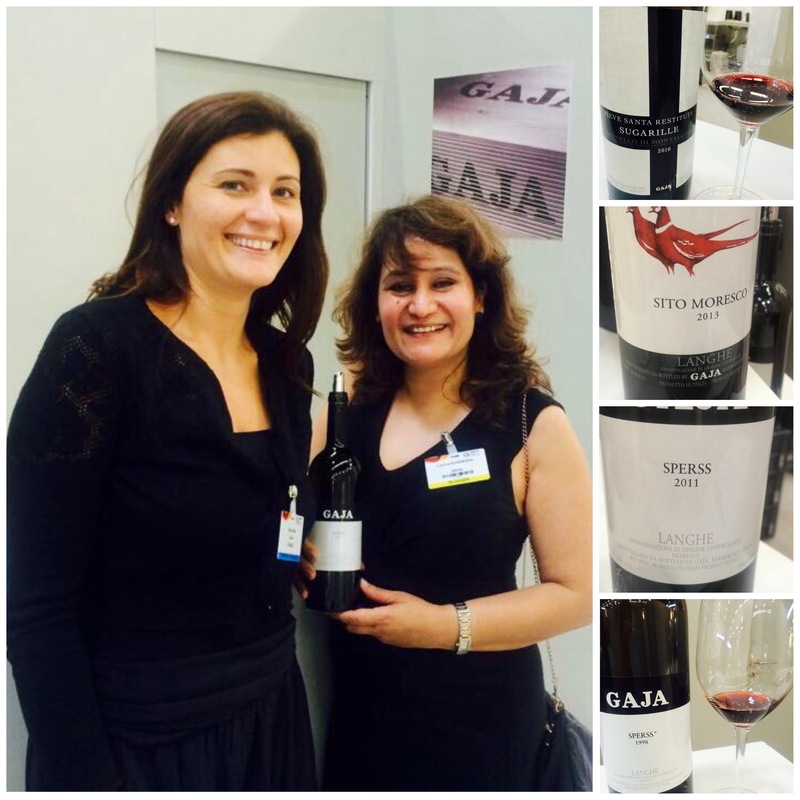 As 5th generation co-owner of Gaja Winery, Gaia Gaja, said this about her father Angelo at the 2017 New York Wine Experience, “He is always looking to the future as artisans don’t ever stop creating”. ‹ Bonjour India 2017-18 opens with a grand spectacle at Amber Fort Jaipur.